The Parker Solar Probe will fly straight through the wispy edges of the corona, or outer solar atmosphere, that was visible during last August's total solar eclipse. It eventually will get within six million kilometres of the sun's surface, staying comfortably cool despite the extreme heat and radiation, and allowing scientists to vicariously explore the sun in a way never before possible. "Fly baby girl, fly!!" project scientist Nicola Fox of Johns Hopkins University tweeted just before liftoff. She urged it to "go touch the sun!" Protected by a revolutionary new carbon heat shield and other high-tech wonders, the spacecraft will zip past Venus in October. That will set up the first solar encounter in November. 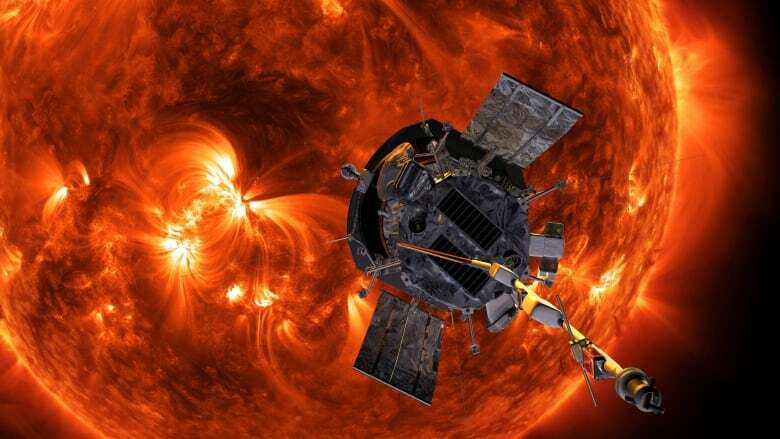 Altogether, the Parker probe will make 24 close approaches to the sun on the seven-year, $1.5-billion US undertaking. For the second straight day, thousands of spectators jammed the launch site in the middle of the night as well as surrounding towns, including 91-year-old astrophysicist Eugene Parker for whom the spacecraft is named. He proposed the existence of solar wind — a steady, supersonic stream of particles blasting off the sun — 60 years ago. It was the first time NASA named a spacecraft after someone still alive, and Parker wasn't about to let it take off without him. Saturday morning's launch attempt was foiled by last-minute technical trouble. "I'm just so glad to be here with him," said NASA's science mission chief, Thomas Zurbuchen. "Frankly, there's no other name that belongs on this mission." 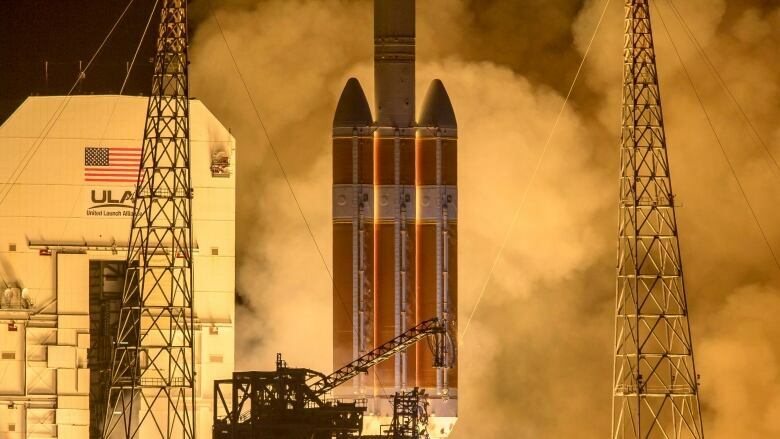 The Delta IV Heavy rocket thundered into the pre-dawn darkness, thrilling onlookers for miles around. NASA needed the mighty 23-storey rocket, plus a third stage, to get the diminutive Parker probe — the size of a small car and well under a tonne — racing toward the sun. From Earth, it is 93 million miles to the sun (150 million kilometers), and the Parker probe will be within 4 percent of that distance. That will be seven times closer than previous spacecraft. Parker will start shattering records this fall. On its very first brush with the sun, it will come within 25 million kilometres, easily beating the current record set by NASA's Helios 2 spacecraft in 1976. By the time Parker gets to its 22nd orbit of the sun, it will be even deeper into the corona and travelling at a record-breaking 690,000 kilometres per hour. "To me, it's still mind-blowing," she said. "Even I still go, really? We're doing that?" Zurbuchen considers the sun the most important star in our universe — it's ours, after all — and so this is one of NASA's big-time strategic missions. By better understanding the sun's life-giving and sometimes violent nature, Earthlings can better protect satellites and astronauts in orbit, and power grids on the ground, he noted. In today's tech-dependent society, everyone stands to benefit. With this mission, scientists hope to unlock the many mysteries of the sun, a commonplace yellow dwarf star around 4.5 billion years old. Among the puzzlers: Why is the corona hundreds of times hotter than the surface of the sun and why is the sun's atmosphere continually expanding and accelerating, as the University of Chicago's Parker accurately predicted in 1958? "The only way we can do that is to finally go up and touch the sun," Fox said. "We've looked at it. We've studied it from missions that are close in, even as close as the planet Mercury. But we have to go there." The spacecraft's heat shield will serve as an umbrella, shading the science instruments during the close, critical solar junctures. Sensors on the spacecraft will make certain the heat shield faces the sun at the right times. If there's any tilting, the spacecraft will correct itself so nothing gets fried. With a communication lag time of 16 minutes each way, the spacecraft must fend for itself at the sun. The Johns Hopkins flight controllers in Laurel, Maryland, will be too far away to help. A mission to get close up and personal with our star has been on NASA's books since 1958. The trick was making the spacecraft small, compact and light enough to travel at incredible speeds, while surviving the sun's punishing environment and the extreme change in temperature when the spacecraft is out near Venus. "We've had to wait so long for our technology to catch up with our dreams," Fox said. "It's incredible to be standing here today." "I'll bet you 10 bucks it works," Parker said.